Looking through some family pictures recently, I saw again a picture of my great grandmother, Clara Barbara “Dolly” (Sturmer) Woodington with her children and some men who boarded at their home in Grant County, Wisconsin, in the southwest corner of the state. This was a practical function of the times–families needed the extra income and boarders needed shelter and food and a place to live when they had to work away from their own homes. My mother remembers the house and there were not very many bedrooms in it so she thought they probably did not stay in the house but would have been given a place to stay on the farm. Dolly did provide meals. Even the hobos who came through on the trains knew to stop at Dolly’s house for a meal. She never just gave them a free meal but always had wood for them to cut and split. When their portion of wood was done, she would serve them a home-cooked meal. Back then, as now, the itinerant travelers kept track of who would help them and who did not, then passed the word on to others who were also in need of help. Dolly’s name was on their list. Dolly Sturmer Woodington “mother” with her children and men who boarded at their house. On the diagonally opposite end of the state of Wisconsin in the northeast corner, Martin Boerner, Sr. also opened up his house to men who worked at the Kimberly-Clark paper mill in Niagara, WI. This is how my grandparents met. Martin’s youngest daughter, Anna, was living with her father when Carl Martin Aderman and his oldest son, Oscar Dearl, went to Niagara to work in the mill. 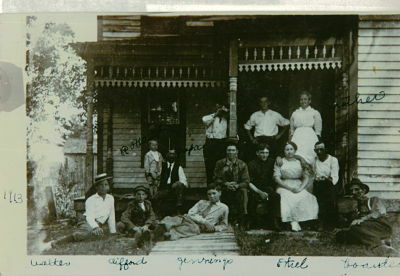 Like other boarders, the Aderman’s had another home (in their case, a farm in Daggett, MI) but had to leave their family behind to go where the work was. They paid a small fee for boarding and got a room and meals. Oscar and Ann struck up a friendship and then married.